Rendering of the urban ballpark at Howard Terminal, California, for Oakland Athletics. The park will be designed by Bjarke Ingels. The Oakland Athletics, a professional baseball team based in Oakland, California, has teamed up with Danish architect Bjarke Ingels to build an urban ballpark at the Howard Terminal. The A’s also plan to redevelop the Coliseum site. “We are excited to build a bold, iconic ballpark at Howard Terminal. 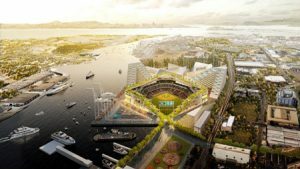 This design will allow us to blur the boundaries of a traditional ballpark and integrate into the surrounding neighborhood,” said Dave Kaval, Oakland A’s president. Bjarke Ingels Group (BIG) aims to create a ‘ballpark within a park,’ an intimate stadium nestled in its urban surroundings. Plans call for a total capacity of 34,000, including fixed seats and general admission experience areas, along with an elevated park wrapping and framing the bowl and coming down to meet the waterfront. The square block of the ballpark will sit within the extended urban fabric of Oakland, transforming the ballpark’s concourses into street, and concessions into restaurants. The A’s plan to revitalize the Coliseum by creating new economic, cultural, and recreational opportunities. Preliminary plans include a large park, surrounded by new housing, a skills center, community gathering space, office and retail developments, and restaurants. The park will be anchored by the two focal points of Oakland sports history: Oracle Arena, repurposed as a concert and cultural events center, and the original Coliseum baseball diamond. The ballpark is set to open in 2023. Seems like another polically-driven boondoggle, just like the Coliseum–compromised for football, compromised for baseball. This new facility will be compromised for the fans. Industrial shipping port site, with heavy rail traffic. No parking, no access to BART, half as many seats. Why not just build a minor league stadium? I’ll bet this one does not get built, unless the Californians are sleeping at the whell.